Download "Better EveryTMTrip. EPA 2010 Engines For Motorhome Applications." 1 Better EveryTMTrip. 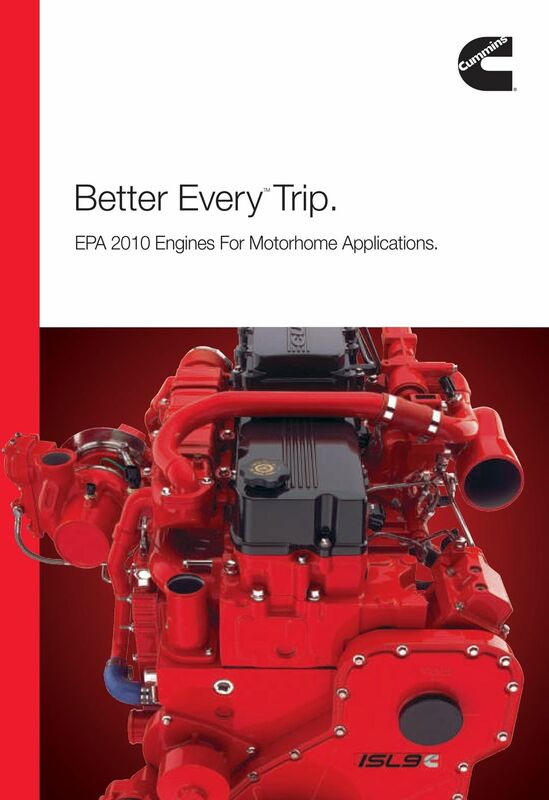 EPA 2010 Engines For Motorhome Applications. 2 Better. 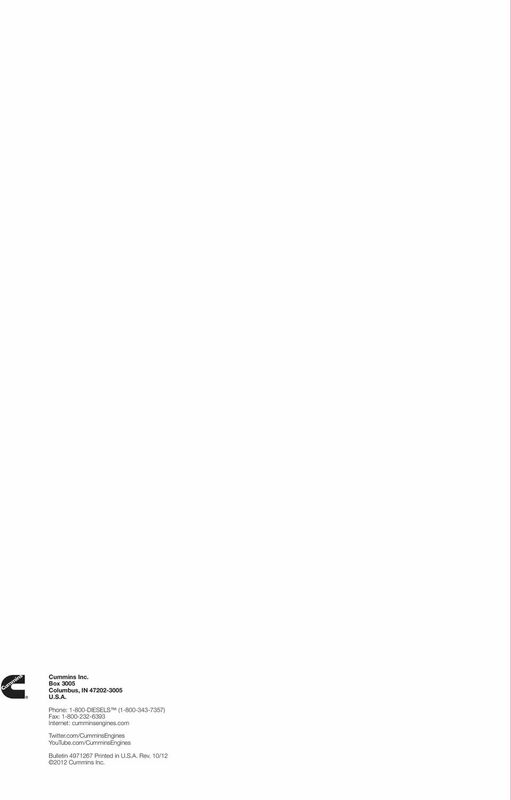 EveryTMTrip. Stricter emissions controls are turning out to be a really good thing not just for the environment, but for Cummins motorhome owners as well. Our lineup of engines meets U.S. Environmental Protection Agency (EPA) 2010 and California Air Resources Board (ARB) emissions regulations, and does so without compromising power, reliability or fuel efficiency. We've added Selective Catalytic Reduction (SCR) to our aftertreatment system in order to achieve nearzero emissions levels while also reducing our carbon footprint. SCR is highly effective at removing oxides of nitrogen (NOx) so much so that we ve been able to reduce the amount of cooled Exhaust Gas Recirculation (EGR) going into the power cylinder and recalibrate the engine for stronger performance and better fuel efficiency than previous models on every engine. 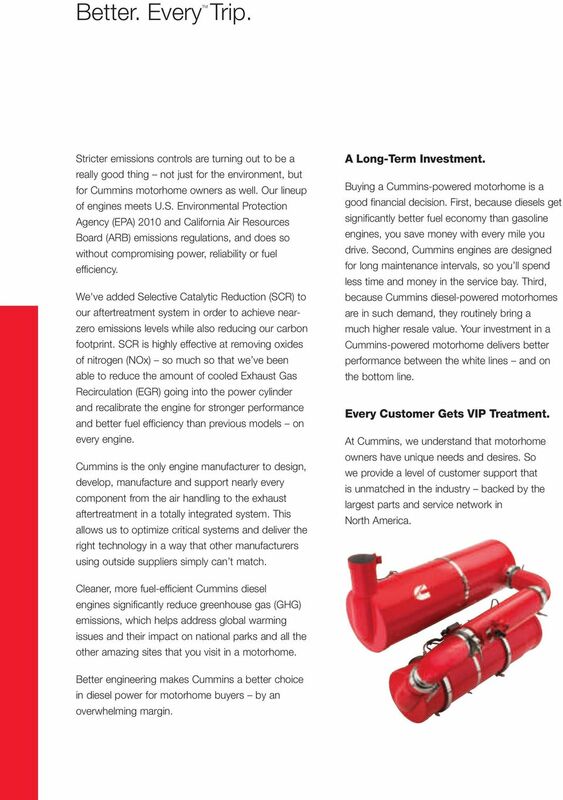 Cummins is the only engine manufacturer to design, develop, manufacture and support nearly every component from the air handling to the exhaust aftertreatment in a totally integrated system. This allows us to optimize critical systems and deliver the right technology in a way that other manufacturers using outside suppliers simply can t match. A Long-Term Investment. Buying a Cummins-powered motorhome is a good financial decision. First, because diesels get significantly better fuel economy than gasoline engines, you save money with every mile you drive. Second, Cummins engines are designed for long maintenance intervals, so you ll spend less time and money in the service bay. Third, because Cummins diesel-powered motorhomes are in such demand, they routinely bring a much higher resale value. Your investment in a Cummins-powered motorhome delivers better performance between the white lines and on the bottom line. Every Customer Gets VIP Treatment. At Cummins, we understand that motorhome owners have unique needs and desires. So we provide a level of customer support that is unmatched in the industry backed by the largest parts and service network in North America. Cleaner, more fuel-efficient Cummins diesel engines significantly reduce greenhouse gas (GHG) emissions, which helps address global warming issues and their impact on national parks and all the other amazing sites that you visit in a motorhome. Better engineering makes Cummins a better choice in diesel power for motorhome buyers by an overwhelming margin. 3 ISB6.7. Every Start. Reliable, durable and the most fuel-efficient engine in the industry, Cummins ISB platform has been a mainstay of the RV industry for years. We ve kept what has made this engine so successful, and enhanced it. The ISB6.7 features a High Pressure Common Rail (HPCR) fuel injection system that enables multiple injection events per cycle for cleaner, quieter and more complete combustion. The proprietary VGT Turbocharger has been improved as well, for strong throttle response and dependability. A 90 percent reduction in NOx has been achieved through the use of the Cummins Aftertreatment System from Cummins Emission Solutions. This has allowed us to reduce the amount of cooled EGR in the power cylinder and recalibrate the ISB6.7 for greater responsiveness while maintaining our fueleconomy leadership. Ratings range from 300 hp to 360 hp ( kw), with a peak torque of 800 lb-ft (1085 N m). ISC8.3. Every Advantage. 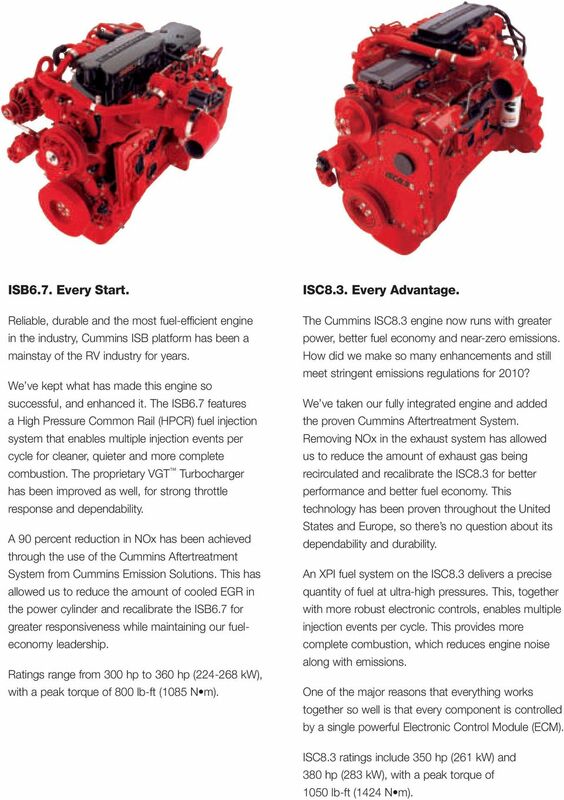 The Cummins ISC8.3 engine now runs with greater power, better fuel economy and near-zero emissions. How did we make so many enhancements and still meet stringent emissions regulations for 2010? We ve taken our fully integrated engine and added the proven Cummins Aftertreatment System. Removing NOx in the exhaust system has allowed us to reduce the amount of exhaust gas being recirculated and recalibrate the ISC8.3 for better performance and better fuel economy. This technology has been proven throughout the United States and Europe, so there s no question about its dependability and durability. An XPI fuel system on the ISC8.3 delivers a precise quantity of fuel at ultra-high pressures. This, together with more robust electronic controls, enables multiple injection events per cycle. This provides more complete combustion, which reduces engine noise along with emissions. One of the major reasons that everything works together so well is that every component is controlled by a single powerful Electronic Control Module (ECM). ISC8.3 ratings include 350 hp (261 kw) and 380 hp (283 kw), with a peak torque of 1050 lb-ft (1424 N m). 4 ISL9. Delivering Better. Every Mile. The bigger and more luxurious the motorhome, the more reason you have to spec a Cummins diesel. The ISL9 delivers everything you expect power, reliability, efficiency and durability every mile of every trip. With a peak torque of 1250 lb-ft (1695 N m), it has the power to climb steep grades with ease, even while towing a vehicle. 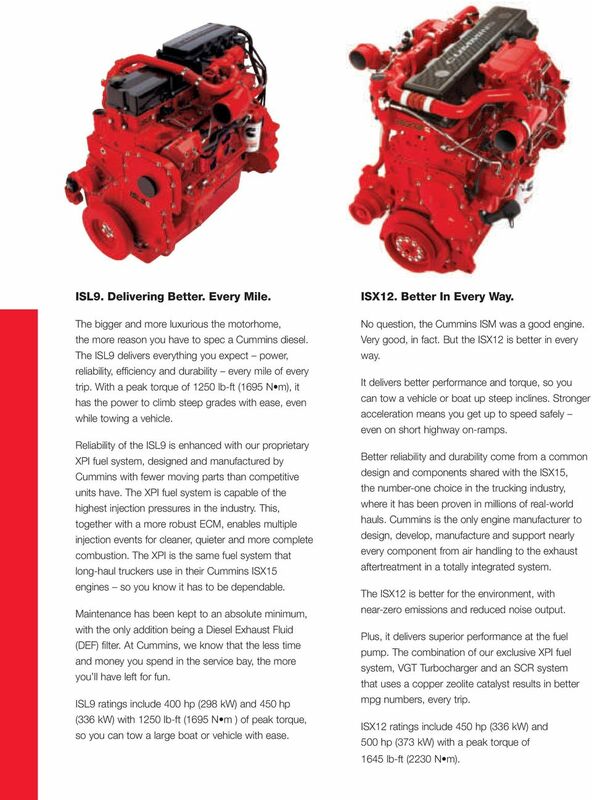 Reliability of the ISL9 is enhanced with our proprietary XPI fuel system, designed and manufactured by Cummins with fewer moving parts than competitive units have. The XPI fuel system is capable of the highest injection pressures in the industry. This, together with a more robust ECM, enables multiple injection events for cleaner, quieter and more complete combustion. The XPI is the same fuel system that long-haul truckers use in their Cummins ISX15 engines so you know it has to be dependable. Maintenance has been kept to an absolute minimum, with the only addition being a Diesel Exhaust Fluid (DEF) filter. At Cummins, we know that the less time and money you spend in the service bay, the more you ll have left for fun. ISL9 ratings include 400 hp (298 kw) and 450 hp (336 kw) with 1250 lb-ft (1695 N m ) of peak torque, so you can tow a large boat or vehicle with ease. ISX12. Better In Every Way. No question, the Cummins ISM was a good engine. Very good, in fact. But the ISX12 is better in every way. It delivers better performance and torque, so you can tow a vehicle or boat up steep inclines. Stronger acceleration means you get up to speed safely even on short highway on-ramps. Better reliability and durability come from a common design and components shared with the ISX15, the number-one choice in the trucking industry, where it has been proven in millions of real-world hauls. Cummins is the only engine manufacturer to design, develop, manufacture and support nearly every component from air handling to the exhaust aftertreatment in a totally integrated system. The ISX12 is better for the environment, with near-zero emissions and reduced noise output. Plus, it delivers superior performance at the fuel pump. The combination of our exclusive XPI fuel system, VGT Turbocharger and an SCR system that uses a copper zeolite catalyst results in better mpg numbers, every trip. ISX12 ratings include 450 hp (336 kw) and 500 hp (373 kw) with a peak torque of 1645 lb-ft (2230 N m). 5 Every Comfort. ISX15. Beyond Every Expectation. 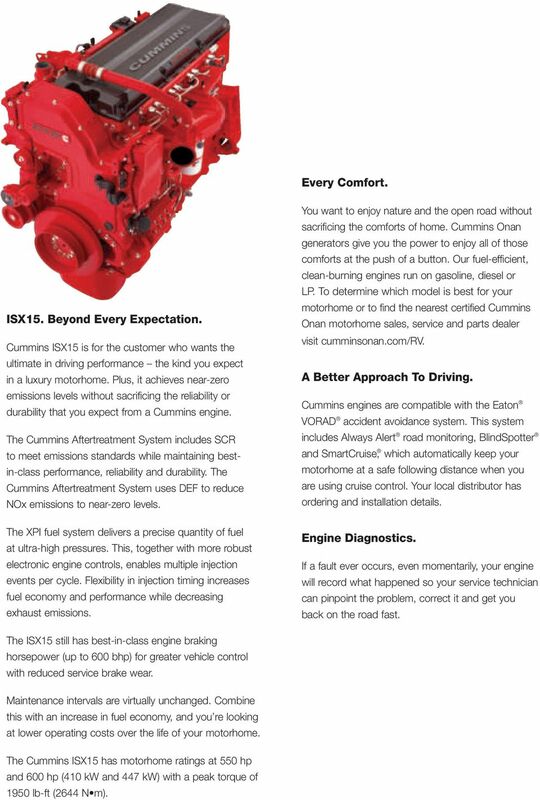 Cummins ISX15 is for the customer who wants the ultimate in driving performance the kind you expect in a luxury motorhome. Plus, it achieves near-zero emissions levels without sacrificing the reliability or durability that you expect from a Cummins engine. 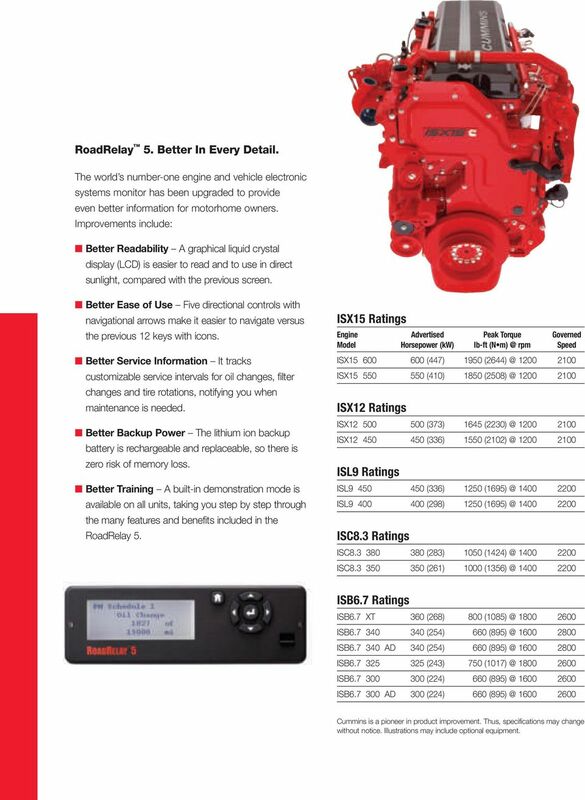 The Cummins Aftertreatment System includes SCR to meet emissions standards while maintaining bestin-class performance, reliability and durability. The Cummins Aftertreatment System uses DEF to reduce NOx emissions to near-zero levels. The XPI fuel system delivers a precise quantity of fuel at ultra-high pressures. This, together with more robust electronic engine controls, enables multiple injection events per cycle. Flexibility in injection timing increases fuel economy and performance while decreasing exhaust emissions. You want to enjoy nature and the open road without sacrificing the comforts of home. Cummins Onan generators give you the power to enjoy all of those comforts at the push of a button. Our fuel-efficient, clean-burning engines run on gasoline, diesel or LP. To determine which model is best for your motorhome or to find the nearest certified Cummins Onan motorhome sales, service and parts dealer visit cumminsonan.com/rv. A Better Approach To Driving. Cummins engines are compatible with the Eaton VORAD accident avoidance system. This system includes Always Alert road monitoring, BlindSpotter and SmartCruise, which automatically keep your motorhome at a safe following distance when you are using cruise control. Your local distributor has ordering and installation details. Engine Diagnostics. If a fault ever occurs, even momentarily, your engine will record what happened so your service technician can pinpoint the problem, correct it and get you back on the road fast. The ISX15 still has best-in-class engine braking horsepower (up to 600 bhp) for greater vehicle control with reduced service brake wear. Maintenance intervals are virtually unchanged. Combine this with an increase in fuel economy, and you re looking at lower operating costs over the life of your motorhome. The Cummins ISX15 has motorhome ratings at 550 hp and 600 hp (410 kw and 447 kw) with a peak torque of 1950 lb-ft (2644 N m). 6 RoadRelay 5. Better In Every Detail. The world s number-one engine and vehicle electronic systems monitor has been upgraded to provide even better information for motorhome owners. Improvements include: n Better Readability A graphical liquid crystal display (LCD) is easier to read and to use in direct sunlight, compared with the previous screen. n Better Ease of Use Five directional controls with navigational arrows make it easier to navigate versus the previous 12 keys with icons. n Better Service Information It tracks customizable service intervals for oil changes, filter changes and tire rotations, notifying you when maintenance is needed. n Better Backup Power The lithium ion backup battery is rechargeable and replaceable, so there is zero risk of memory loss. n Better Training A built-in demonstration mode is available on all units, taking you step by step through the many features and benefits included in the RoadRelay 5. ISX15 Ratings Engine Advertised Peak Torque Governed Model Horsepower (kw) lb-ft (N rpm Speed ISX (447) ISX (410) ISX12 Ratings ISX (373) ISX (336) ISL9 Ratings ISL (336) ISL (298) ISC8.3 Ratings ISC (283) ISC (261) ISB6.7 Ratings ISB6.7 XT 360 (268) ISB (254) ISB AD 340 (254) ISB (243) ISB (224) ISB AD 300 (224) Cummins is a pioneer in product improvement. Thus, specifications may change without notice. Illustrations may include optional equipment. 7 Expert Service. EveryTM Location. Better Customer Support. Every Hour. No other diesel engine manufacturer has as many authorized service locations across North America, with as many factory-certified technicians. But our dedication to service doesn t stop there. We offer rapid parts ordering through QuickServe Online, Cummins Care and dedicated Coach Care facilities designed to meet the needs of every motorhome owner. QuickServe Online. The right information is priceless. Things change so rapidly today that you can t afford to take a chance on outdated information. Paper manuals and CD-ROMs can t always keep pace with ever-changing parts and service information. You need the most current information continuously updated every minute of every day. The Internet is the answer. 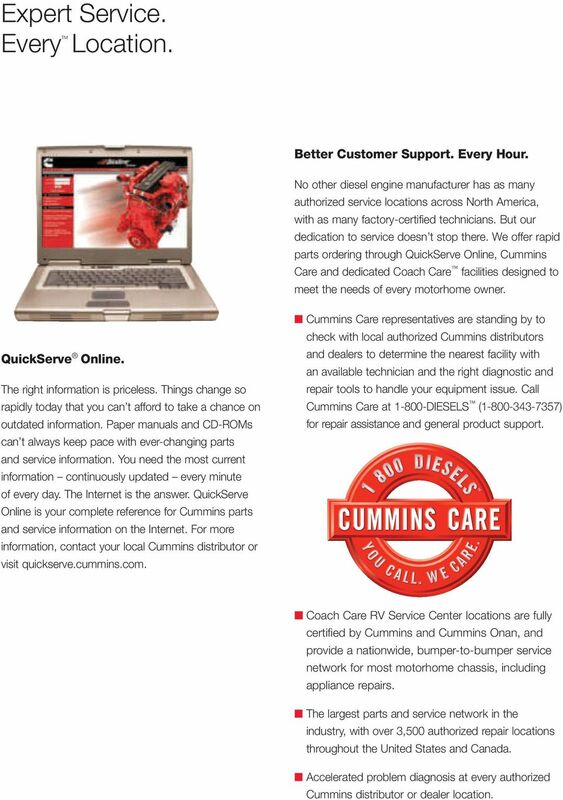 QuickServe Online is your complete reference for Cummins parts and service information on the Internet. For more information, contact your local Cummins distributor or visit quickserve.cummins.com. n Cummins Care representatives are standing by to check with local authorized Cummins distributors and dealers to determine the nearest facility with an available technician and the right diagnostic and repair tools to handle your equipment issue. Call Cummins Care at DIESELS ( ) for repair assistance and general product support. n Coach Care RV Service Center locations are fully certified by Cummins and Cummins Onan, and provide a nationwide, bumper-to-bumper service network for most motorhome chassis, including appliance repairs. n The largest parts and service network in the industry, with over 3,500 authorized repair locations throughout the United States and Canada. n Accelerated problem diagnosis at every authorized Cummins distributor or dealer location. 8 Cummins Inc. Box 3005 Columbus, IN U.S.A. Phone: DIESELS ( ) Fax: Internet: cumminsengines.com Twitter.com/CumminsEngines YouTube.com/CumminsEngines Bulletin Printed in U.S.A. Rev. 10/ Cummins Inc.
Cummins ISX Regeneration Process 1 Introduction Cummins ISX EGR : Exhaust Gas Recirculation DPF : Diesel Particulate Filter VGT :Variable Geometry Turbocharger SCR : Selective Catalyst Reduction 24V CONTROLS! fuel efficiency efficiency Proven strategies to boost your mileage, performance and savings. Driver Tips. For Cummins On-Highway Heavy-Duty And MidRange Engines With Aftertreatment. Volvo D13 Engine Family The Volvo D13 s efficiency, power and light weight improves reliability and operating costs, while meeting EPA regulations. Fourteen power ratings are available, from 375 to hp. 1 Air-to-Air AfterCooling. 2 Engine Only. Capacity will vary with radiator size and use. of cab heater. SUBJECT: Instrumentation changes related to 2013 Emission and On-Board Diagnostics (OBD) requirements. Plugging In: A Consumer s Guide to the Electric Vehicle Today s Choices in Cars Late in 2010 the first mass-produced electric vehicles hit dealer showrooms, bringing car buyers a new, electric option.